Duncan you are so restrained. I always have PLENTY TO SAY when someone insists on giving me a bath. 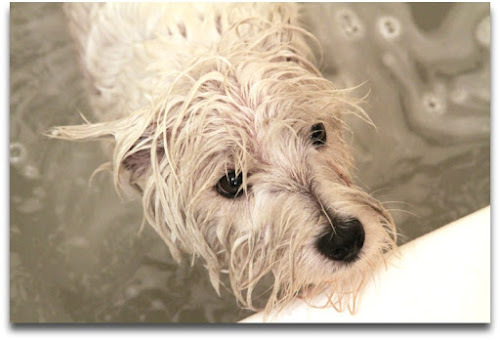 Gavin does very well in the bath like you do Duncan, but he looks just as pitiful as you too! Poor baby. But remember you will smell so delicious momma will want to love up on you!! Run awaaaayyyyy! Guess it's too late. The dreaded four letter B word. Happens to us all sometimes. UH OH! Looks like somebody is getting a bath! Awww...been there!! Shake and RUN! !